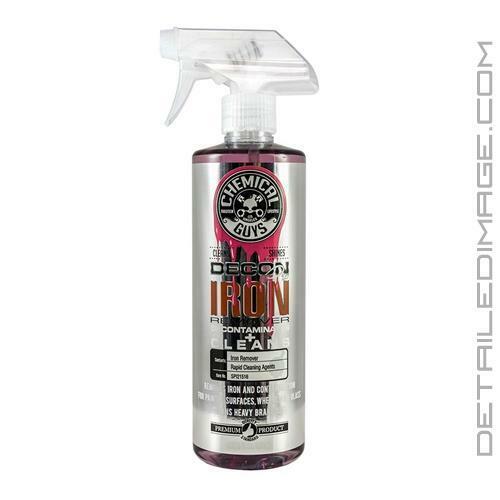 The Chemical Guys DeCon Pro Iron Remover will help you remove stubborn iron deposits (i.e. brake dust) from your wheels and paint easily and safely. When you press on your brakes while driving, your brake pads and rotors touch. This high speed contact and friction causes your pads and rotors to heat up and discard tiny hot shards of iron, metal, and carbon. These scorching hot shards etch into your paint, wheels, etc. making them incredibly difficult to remove. Scrubbing and degreasers will often not remove them but this is where the Decon Pro is an incredibly valuable product! Spray DeCon Pro's gel formula onto the surface and it clings to each area you spray it on, so it has more time to react with the deposits. As it breaks down the embedded deposits the formula changes colors to a deep purple and it can be rinsed away with ease. For any heavily contaminated areas, multiple applications, agitation, or longer dwell time may be necessary. Once you are finished you will be amazed at how many of those ugly iron deposits have been removed! DeCon Pro is pH neutral and safe on the exterior so you'll love how it cleans your wheels and paint. 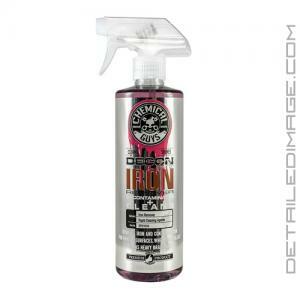 Don't let unsightly iron deposits ruin your beautiful finish, grab the Chemical Guys DeCon Pro Iron Remover today! Con Pro is a revolutionary gel that removes iron deposits and contamination from paintwork and wheels. The only way to truly remove iron particles from your vehicle is using DeCon Pro. The pH balanced gel safely removes iron particles from the surface of any vehicle is using DeCon Pro. The pH balanced gel safely removes iron particles from the surface of any vehicle. DeCon Pro is designated to release iron particles such as brake dust, rail dust, ferrous metal, and industrial contamination. Iron deposits can corrode on wheels and paintwork and cause paint and clearcoat failure. DeCon Pro eliminates iron deposits by cleaning the surfaces pores to preserve paintwork and wheels. The sprayable gel cleaner easily removes heavy brake dust and road grime to restore wheels. Easily removes ferrous brake dust to protect wheels and rims from further corrosion. The special catalyst in DeCon Pro turns purple once the highlights ferrous iron contamination which can be easily rinsed away using clean water. Decontaminate paint and metal, and remove iron deposits from any vehicle with Chemical Guys DeCon Pro. Allow DeCon Pro to dwell on the surface for 3-5 minutes. I don't think this product is as powerful as say Sonax, which is the brand I bought afterwards. I tried it on my wife's car and really didn't get much other than the fact it stripped all the wax/sealant off. I love CG products, but not this one. More like a strong APC. I purchased this from a detail shop after I ran out of Sonax . Beside costing just as much it's not near as good as Sonax Full Effect. I like CG products too but I have to give a thumbs down on this one. I'll try it on my test vehicle paint to see if I can put it to some good use. It ain't great on brake dust.